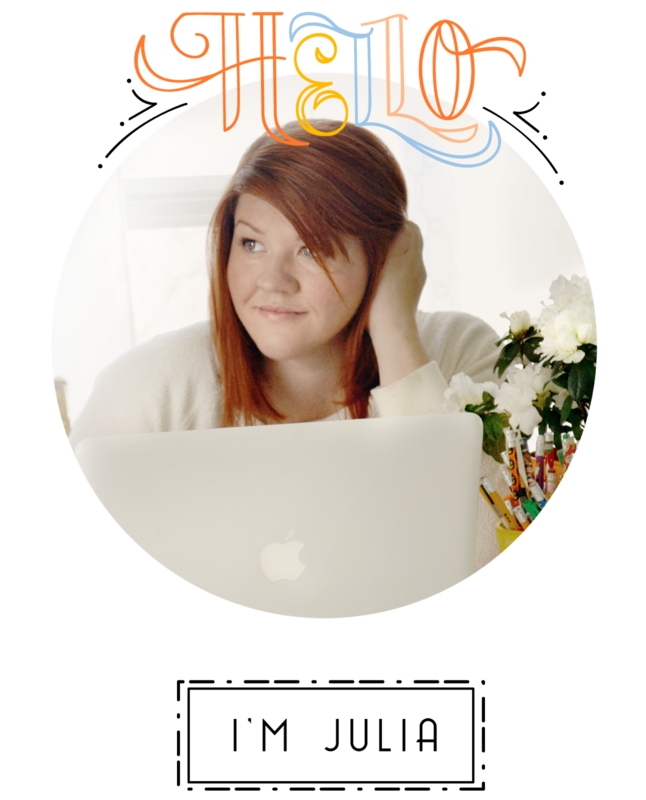 It’s easy to get caught up with family life where everything seems to revolve around nap time and homework. Being in my 30’s and in the throes of motherhood means It’s harder to stay in touch with our friends as much as we used to and we can easily forget that we actually have a life outside of these little critters we love so much. 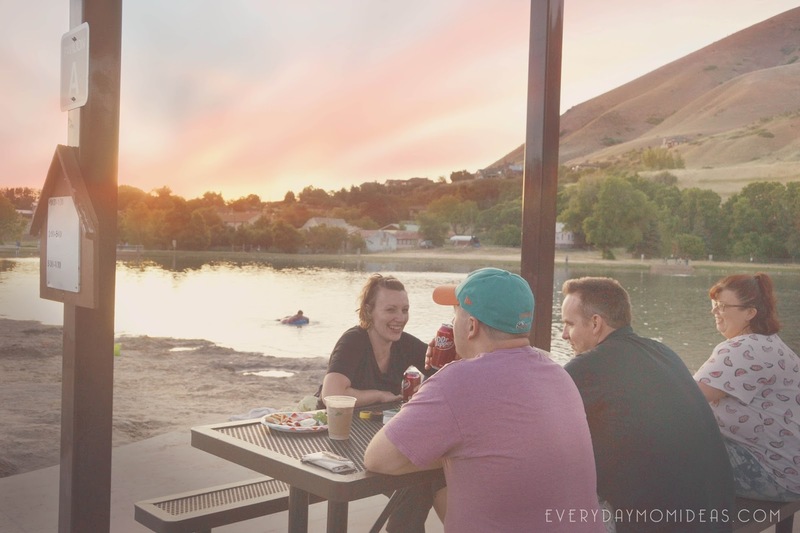 It’s so important to get out once in a while and do things that remind us of how young and spry we still are, take the time to reconnect with our friends and just have a night off from parenthood. That’s why my husband and I threw a Dr Pepper themed summer kickoff party at the nearest beach we could find, our local reservoir. Our kids just had an end of school water party a few weeks ago so, why shouldn’t we?! 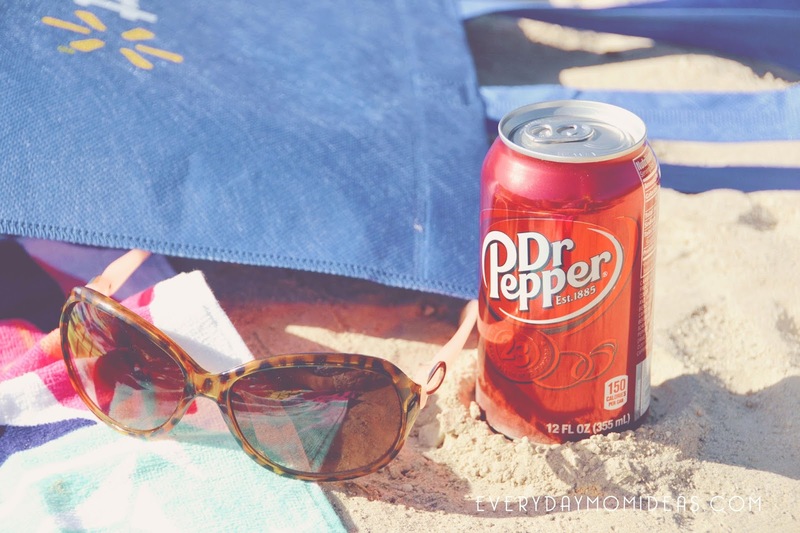 I was recently asked by Dr Pepper to share unique ideas on connecting with friends with a summertime bash and I was more than excited to start planning my next party. 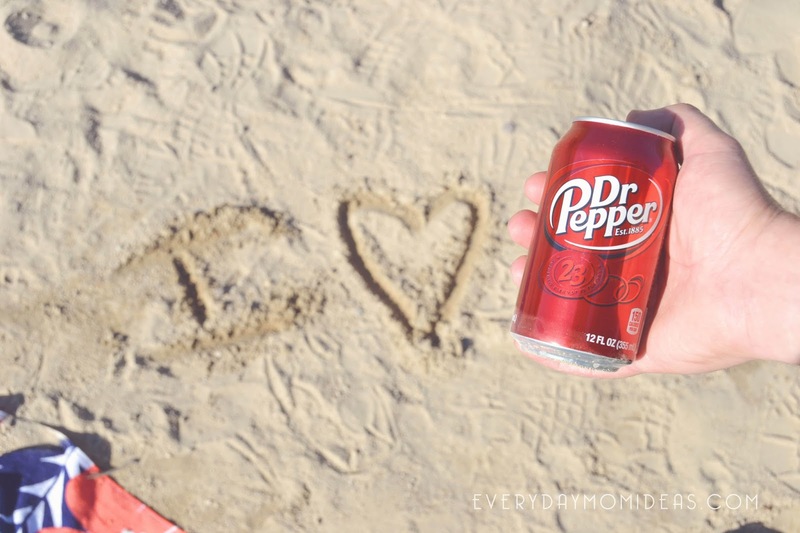 It wasn’t hard to plan a party around summer, beaches and Dr Pepper. 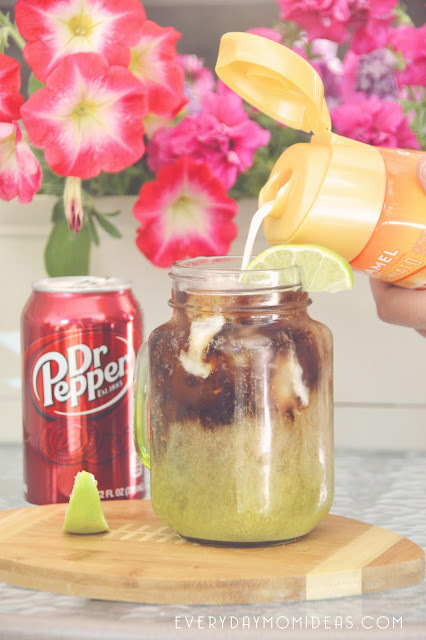 I decided to go with a Dr Pepper theme and feature this drink in my recipes as well. We easily found everything we needed for the party at our local Walmart. 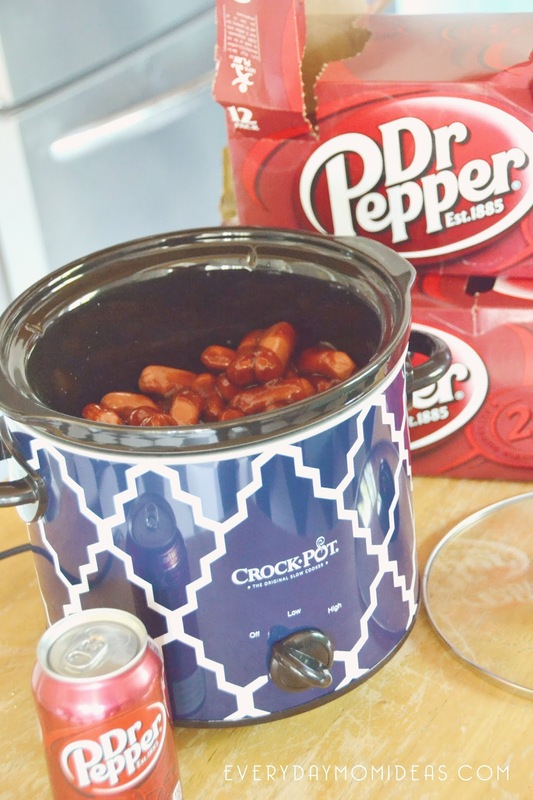 My husband and I made Dr Pepper Lil Smokies ahead of time in the crock pot and prepped what we needed to make virgin Dirty Dr Pepper drinks. I liked the interaction of making these specialty drinks for my guest, they were a huge hit and the Dr Pepper Smokies went so fast because of how delicious they were. Need: 1 Classic Dr Pepper, ¼ fresh lime, 2 TBS of flavored Creamer (found in the dairy section, almond, coconut or caramel creamer works best) Ice. 2. Pour in the Dr Pepper ¾ of the way full. 2. 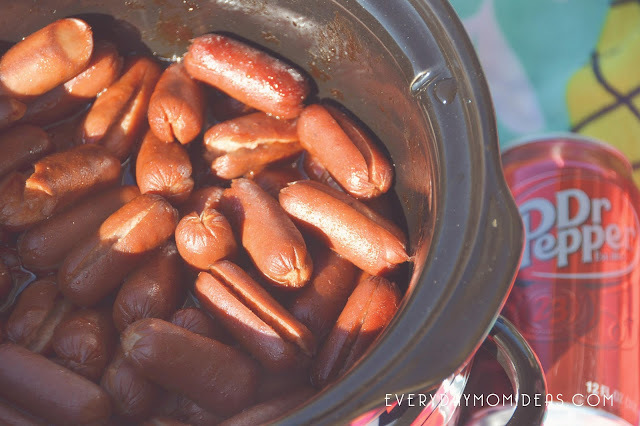 Add Smokies to crock pot. 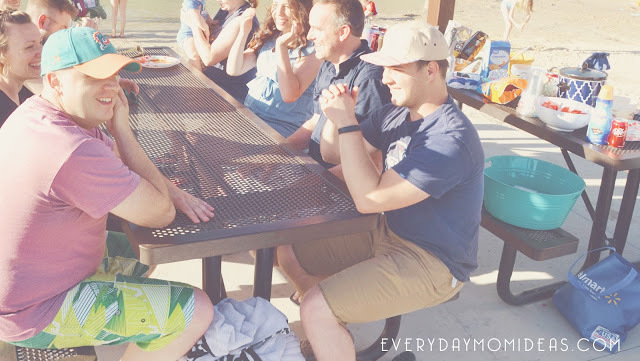 Even though we had a beach a fun body of water to keep us busy, It’s always good to have a few easy party games prepared to keep the party lively and help guest get to know each other better. 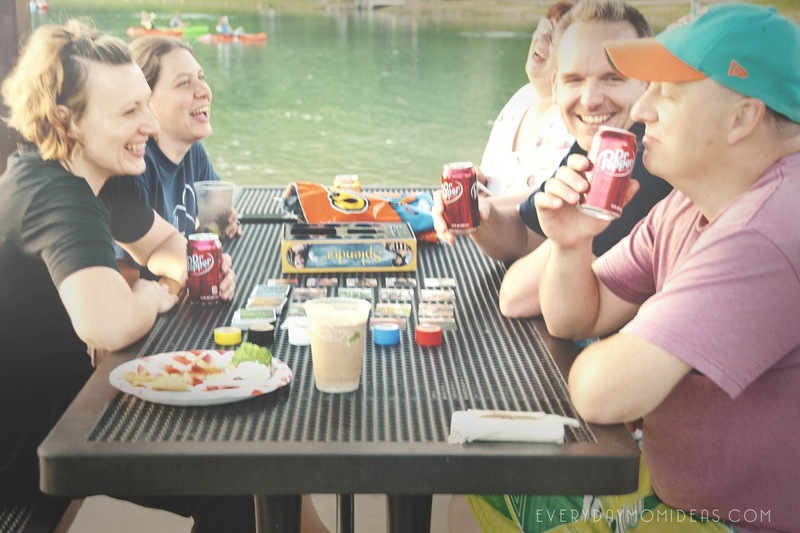 Here are four clean games for your grown up friends that take little to nothing to pull off. This game needs at least two players. It’s another one of those games that are perfect for getting to know more about your campmates. However, in this game, you will get to know who's done ridiculous, crazy, or stupid things. Each player will need 10 pennies each to give away. To start, one guest will complete the statement “Never have I ever…” with something he or she hasn’t done. Then, whoever in the group that has done it, has to give a penny to that player. For example, I say, “Never have I ever gone skinny dipping.” Then anyone in the group who has done it has to give me a penny. The person who collects the most pennies win. In this game, one person acts as host. He or she doesn't play, but instead, must select a murderer and a detective from the group. To do so, the guest must close their eyes so the host can go around and pick. The host selects the murderer by tapping twice on their head, and the detective by tapping twice on their shoulders. Once the host is done selecting, the whole group can open their eyes. Then the fun begins. The objective of the murderer is to "kill" the other players by winking at them. On the other hand, the goal of the detective is to find out who the murderer is. The “civilians” in the game have to try to “die” dramatically when the killer winks at them. The detective will have to make three guesses of who the murderer is. If he or she gets it right, he can be the host in the next round. If not, then he remains the detective. The murderer on this round can be the next host. This game requires two teams. If you have a phone, there’s are several apps for this game. However, you can go old school and write down the words instead. The objective of the game is to guess as many words on the cards/phone correctly before time is up. To play, choose one person from your team to do the guessing. Place the phone, the card or the paper with a word on the player’s forehead and make sure he or she can’t see it. The player has to guess what the word is, by asking yes or no to his group. Those are the only hints he or she can get. When the player guesses the word right, you can give more, until the time is over. Put together a bowl full of celebrity names on small pieces of papers. When your guests arrive have them tape the name to their forehead or back without looking at the name. Now they have to go around and can only ask yes or no questions to other party goers to find out who they are. Make it more interesting by having a prize for the first one to guess their name or theme the Who Am I Names with famous movie characters or important historical figures. I received the 6 pack can/bottle holder with built in ice pack and it was so convenient to load up the drinks and go. I like that you can just throw the whole ice pack bottle holder into the freezer the night before and easily slip your drinks into it without having to mess with finding and loading a cooler. The drinks are held in tight with the stretchy material so you don’t run the risk of them falling out and banging all around. It’s a nifty little contraption. 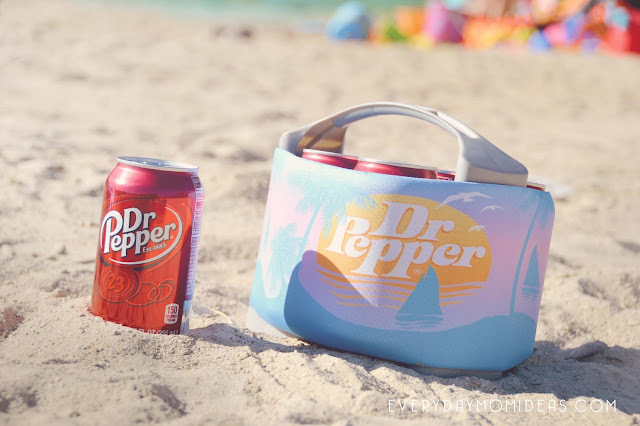 When I told my husband we were going to have a summer kick-off Dr Pepper themed party sponsored by Dr Pepper he thought it was the best party idea he had ever heard of in his life. It might have been because Dr Pepper is his very favorite drink in the whole wide world or because he is sick of doing home improvement projects every night…we many never know. The party was amazing to say the least. I’m so very glad we got to take time and re connect with our friends and make those relationship stronger. At the end of the night after we had watched the sunset over the water and valley and played our last game, and said our last good bye, I thought to myself how much I needed this grown up night out on the beach and how lucky I am to have the friends that I have.